I’m a contributing writer of CriptoNoticias.com the most reputable news website about Bitcoin, cryptocurrencies and blockchain technology for Spanish speaking people. This is unique ecosystem where value is created with few artistic level, so far, but supported by an amazing technology behind and a great community which is always inspiring through humor to grow itself. 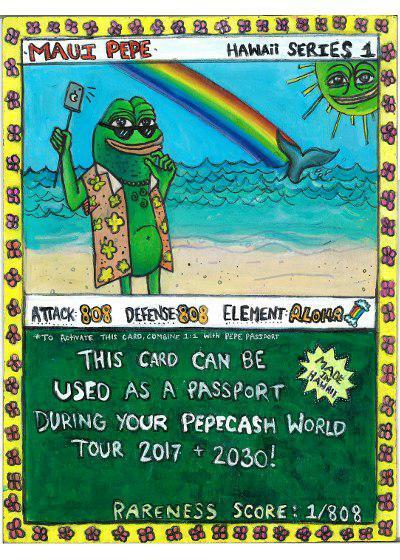 I believe PepeCash will be one of the next alt coins to have in the future, so I’m holding all my RAREPEPE profits on this crypto-currency. Also I’ve bought some coffee with the money earned. I love to laugh and to produce laughs, and this ecosystem is full of it. Also blockchain technology and crypto-currencies are involved, so it couldn’t be ignored by me. So far, almost nothing. 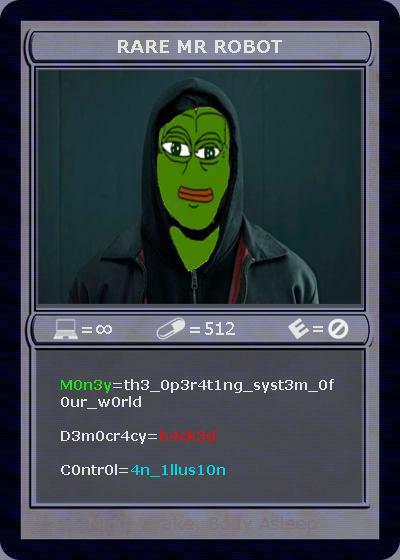 But sooner than later people (I hope most kids and teenagers) will learn that Rare Pepes are a great way to understand the new ways that value are being created. I’m a fan on the first series of Rare Pepes. Cards made with very few artistic level but with a very clear concept. Of course I value best design techniques, but for me the concept is the main feature of the cards. I’m trying to focus on popular themes inside the crypto ecosystem, but no directly related to Bitcoin. I focus more on music, memes, TV shows and popular characters that crypto-enthusiasts loves and enjoy. PeperMind. Is a little tribute to the 25th anniversary of Nirvana’s album “Nevermind”. I love the blue color because is pretty different to most cards, and of course the details like the PEPECASH cards instead of a Dollar bill and the card description containing some album song titles. Is a great card, sweet design, very precise concept, excellent usage of the “Illuminati cliches” and low number of cards issued. 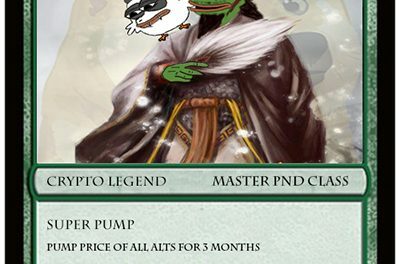 I will be Trump on ChynaPepe, because of his ability to manipulate crypto markets. I want to create an unique and recognized style, like any artist in any space want. Also, be part of this growing and promising ecosystem that will impact more than we imagine in the future. The Founder of CriptoNoticias, Héctor Cárdenas (@hcarpach on Telegram) has created great designs, specially PepeMining. Rare Pepes can be like sneakers market on the US, but digital and global. And has the potential to become one of the first elements to introduce kids to the cryptocurrencies world. A good achievement for the community, without a doubt. It can represent a transition to most organized mechanisms and structures in order to make Rare Pepes more popular and valuable. I wanna say thanks to Mike for beginning this thing, to John Millar Zavati for work on improvements and RarePepeParty, and to all the development team to believe in the community and add value to the platform. This is a great humoristic space, that we take very seriously. PreviousBrace Yourselves, PEPEFREEZE is Coming!